Ireland fought hard to beat Bangladesh by five runs in their final warm-up match at Moors Sports Club in Colombo. Paul Stirling and Kevin O'Brien were the heroes at two ends of the game though it was Trent Johnston's tight final over that ensured two wins out of two in the preparation phase after having crushed Zimbabwe by 54 runs. 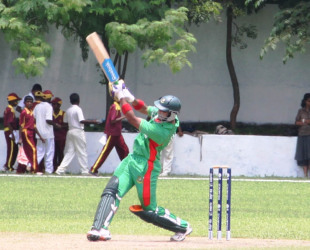 Bangladesh's best player, Shakib Al Hasan, was outstanding with bat and ball but couldn't prevent defeat. After an hour's delay due to wet conditions, Stirling dominated the opening stand of 46 with captain William Porterfield before adding 64 for the second wicket with Ed Joyce. It was broken when Stirling fell to Elias Sunny for a 41-ball 71, letting Bangladesh enough room to fight back. Shakib Al Hasan and Mashrafe helped restrict them to 164-6 after they had rushed to the 100-mark in the 11th-over assault on Mahmudullah that went for 24. Bangladesh began in similar fashion though they lost Mohammad Ashraful in the second over. Tamim Iqbal and Shakib added 63 in 6.1 overs before Tamim was caught and bowled by Alex Cusack. Shakib kept up the rate with a 23-ball fifty but his dismissal sparked off a collapse, for the second game in a row. O'Brien did the damage picking up three important wickets - captain Mushfiqur Rahim, Nasir Hossain and Mahmudullah - in the space of ten balls. All three batsmen have shown the ability to finish games in the past, but even though the asking-rate wasn't too high, they were unable to complete the job. Ziaur Rahman and Mashrafe Mortaza steadied the chase but when Mortaza fell in the penultimate over, Sunny played four dot balls in a row and the game swung back in Ireland's favour. The win was all but confirmed when Johnston removed the dangerous Ziaur off the third ball of the final over. When ten overs remained, all Bangladesh needed was 62, with eight wickets in hand, and victory seemed certain. Bangladesh managed to lose their way, though, much to Shakib's disappointment. "I honestly think this should actually shake us up a little," he said after the defeat. "I believe we lacked intensity in the last ten overs because with the batting we have there is no reason why we should lose that game from the position we were in. You always learn more from defeats." Shakib also stressed that the team morale shouldn't dip despite the reverse against an Associate nation. "Practice games are important but they are not that important that you should start feeling demoralised over a loss in such games. These matches allow you to assess where you are at individually and as a team and you work on the findings."